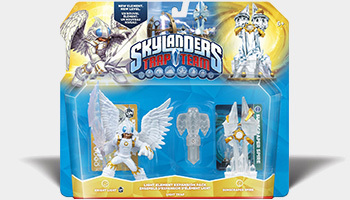 Thanks to the ever eagle-eyed myskylanders.de we now have a detailed arrangement of the new toys that make up Wave 4 of Skylanders: Trap Team. This new selection of toys is apparently scheduled for release in Europe either at the end of February or in the middle of March. 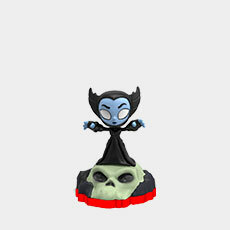 Wave 4 will also bring to US retail the singles for Bat Spin and High Five who were a part of Wave 3 elsewhere. 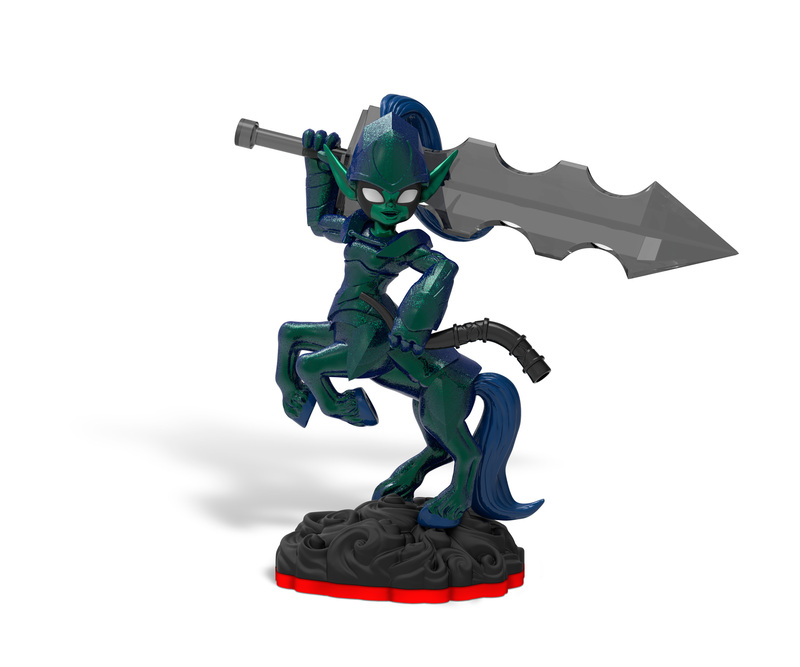 There are also single releases for the new Dark and Light Trap Masters Knight Mare and Knight Light. 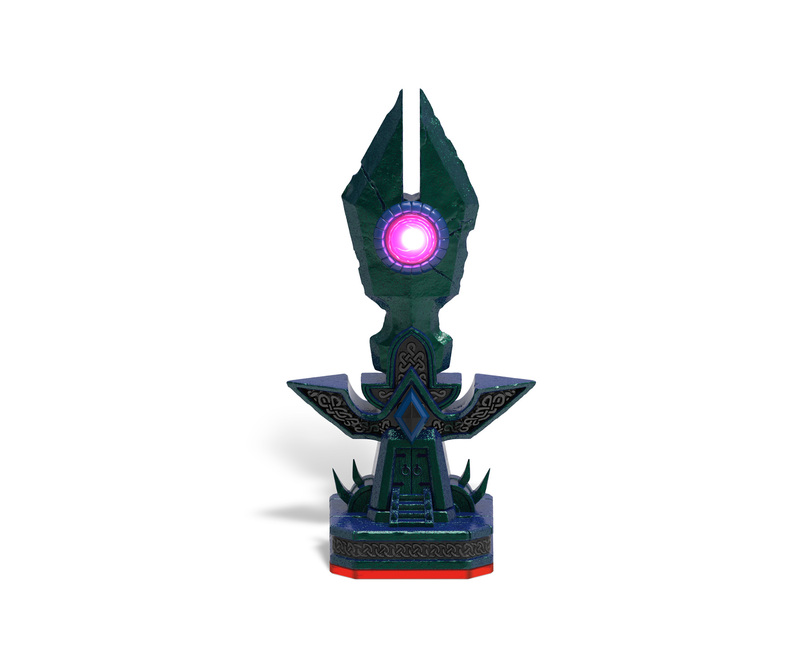 This will allow you to access the Dark/Light Elemental Gates without having to buy the full Expansion Packs. 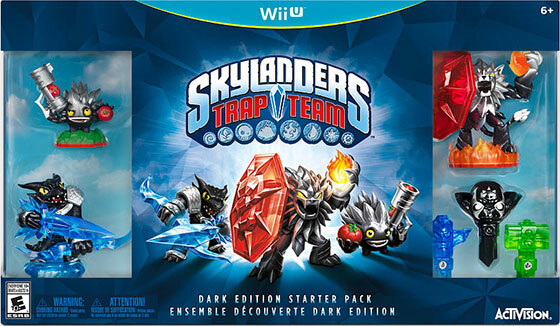 There will also be two new Trap Triple Packs. One contains Tech, Fire and Kaos traps, and the other contains Air, Undead and Magic traps. Legendary Bushwhack is apparently due for release this very Sunday at Toys R Us. 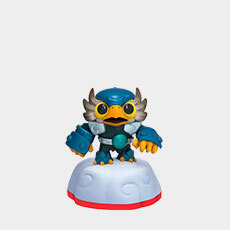 And on the same day Nitro Head Rush is due out as well at Target. 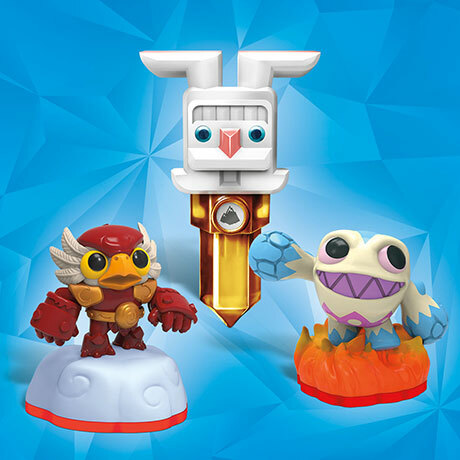 Power Punch Jet-Vac and Eggsellent Weeruptor have been unveiled for an Easter release along with a special looking Earth Handstand trap. 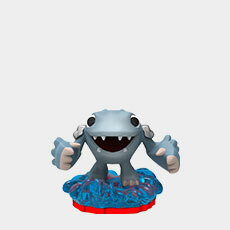 And of course don't forget Love Potion Pop Fizz for Valentine's Day, he's available right now. 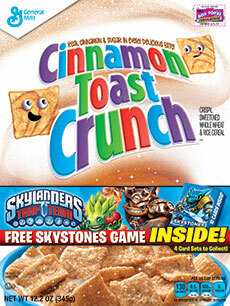 For those of you looking for something more than just the in-game toys, from February 14th in the US specially marked boxes of General Mills cereals (including Honey Nut Cheerios, Cinnamon Toast Crunch, Reese's Puffs, Trix and Lucky Charms) will have a pack of 10 Skystones cards inside that can be used to play a game of Skystones for real! 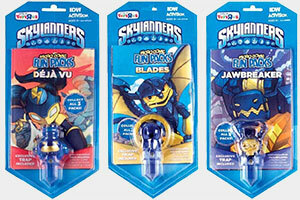 There are four different packs to collect each with two "boss" cards included. See this forum topic for sightings and more details on the cards themselves. Finally confirming the rumours, Activision today released official information regarding the two new elements, Light and Dark, and giving the Element Expansion Packs a release date. 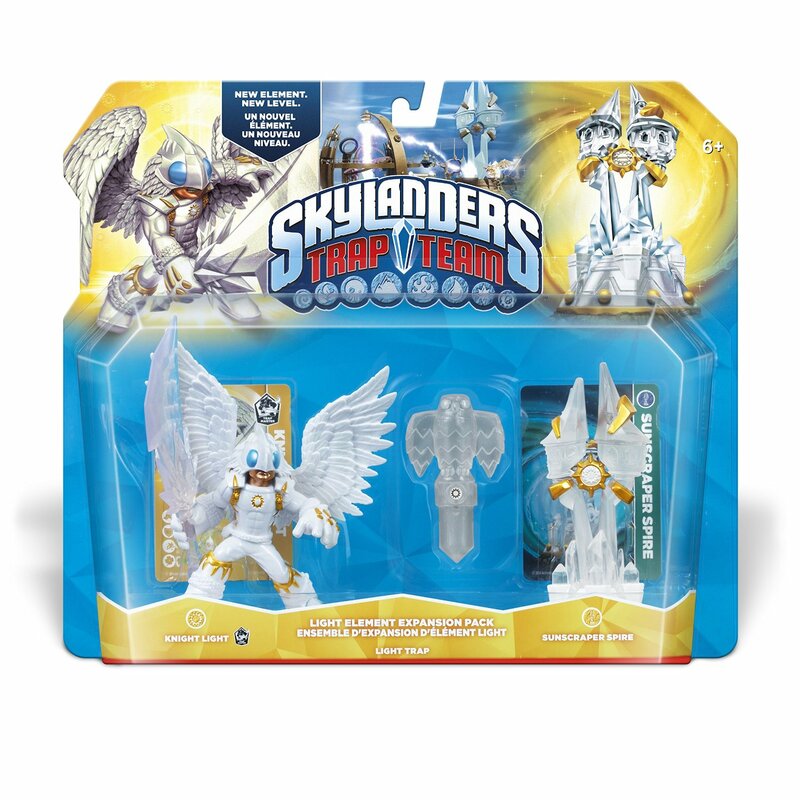 In the United States it'll be on the 21st of December at Toys R Us, that's this Sunday! 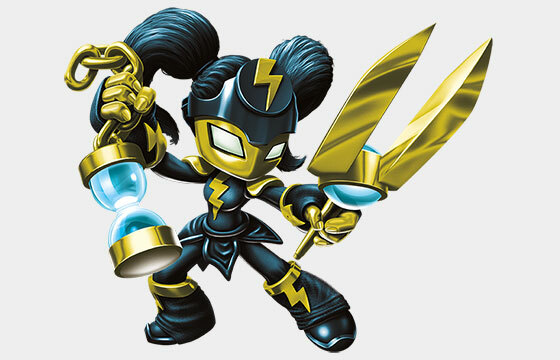 They also gave us a glimpse at the other two members of the Light and Dark families: Spotlight and Blackout. 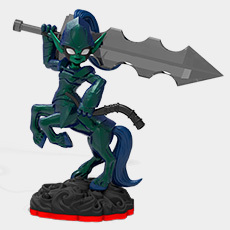 Unfortunately there was no accompanying release date for these core Skylanders. 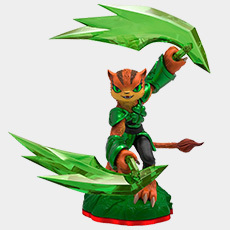 You can check out a load of screenshots screenshots and artwork of all four new Skylanders in the Trap Team Gallery as well as last Friday's news post for images of the Element Expansion Packs themselves. 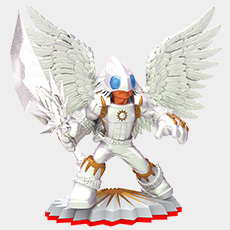 Thanks to German Skylanders fansite myskylanders.de we now have images of the as yet unannounced Light and Dark Element Expansion Packs and their contents for Skylanders: Trap Team. 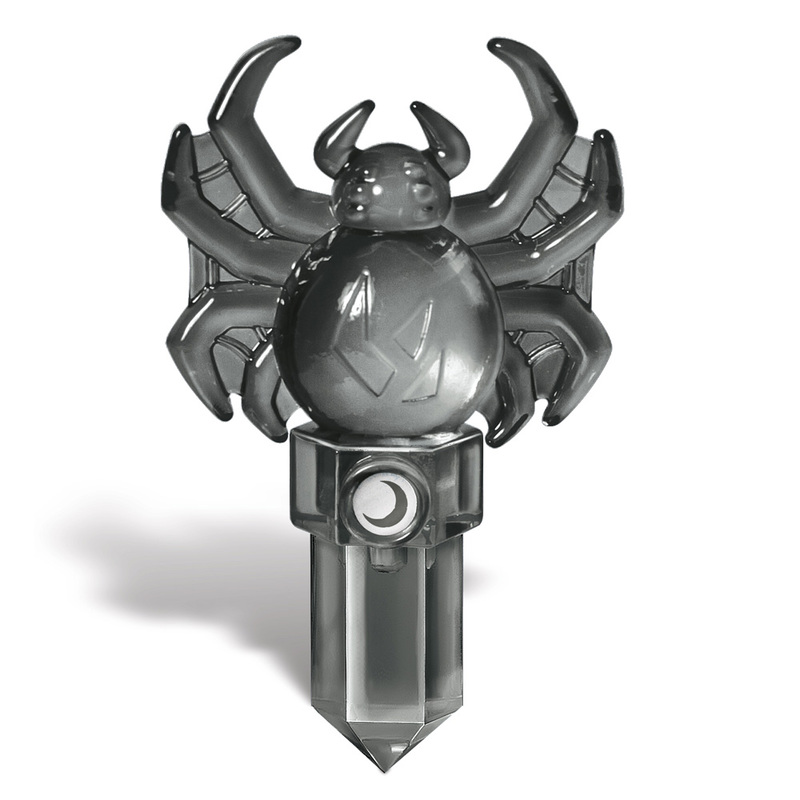 The Dark Element Expansion Pack comes with the Dark Trap Master "Knight Mare", a Dark Trap in the shape of a Spider, and the Midnight Museum Location Piece which unlocks the Midnight Museum chapter. 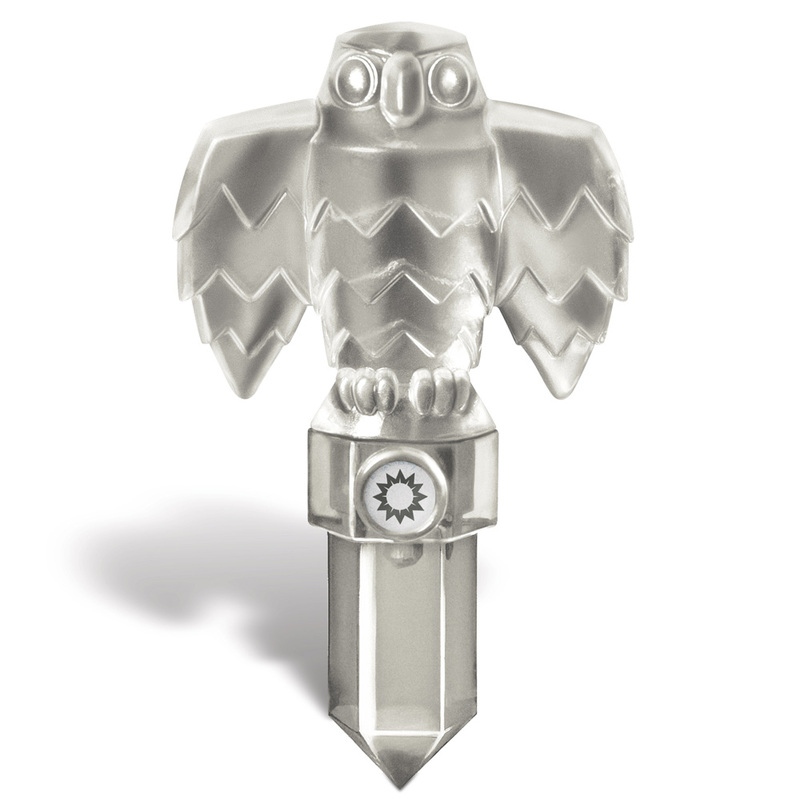 The Light Element Expansion Pack comes with the Light Trap Master "Knight Light", a Light Trap in the shape of a Hawk, and the Sunscraper Spire Location Piece which unlocks the Sunscraper Spire chapter. 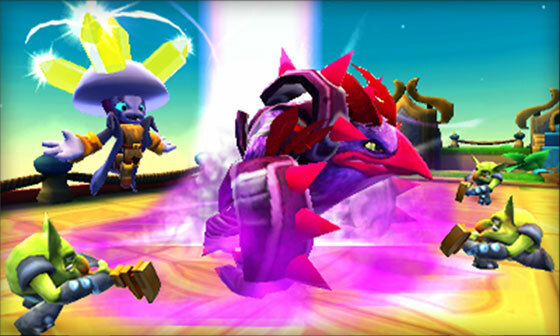 The Trap Masters will grant you access to the unknown element gates scattered throughout the game and the traps will let you catch the unknown element villains, which means that, combined with Blastermind from Wave 3, these will finally let you complete Skylanders Trap Team to 100%. The exact release date of the Element Expansion Packs is still unclear but some European retailers have a date listed as early as the 18th of December. The third wave of Skylanders Trap Team has been revealed, it will include three new Trap Masters, 4 new Core Skylanders, 3 new Minis and eight new Traps. No specific dates were given. Time for some wild speculation: Unlike the first two waves it is probable that this "wave" will be split apart and have each grouping release at slightly different times. 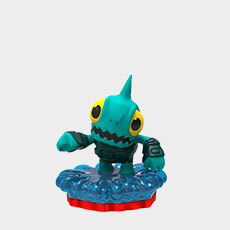 The ongoing Frito-Lay High Five giveaway means that the Core Skylanders are not likely to be released until early next year but the Trap Masters and Traps are under no such restrictions and could be released earlier than that. Check out the full breakdown of what will be in the retailer's boxes including the restocks of already released characters. 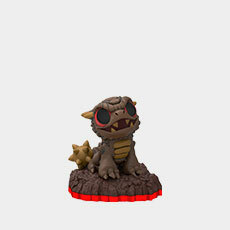 The new Legendary items at Toys R Us, including the Micro Comics with exclusive Legendary Traps, are currently in the middle of being released. Legendary Deja Vu and the Legendary Deja Vu comic were released yesterday, the Legendary Blades comic will be on Sunday, and the Legendary Jawbreaker comic a week later on the 16th of November. 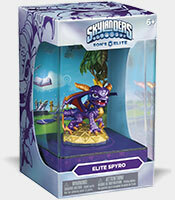 The first two of the Eon's Elite collection, Elite Spyro and Elite Chop Chop, became available at GameStop this past weekend and the next one has been announced as Elite Trigger Happy, he'll go on sale at the end of the month on the 28th. And finally, the 8 Pack of Traps with the variant villain Steamed Broccoli Guy is apparently due for release very soon at Target (with reports of sightings already coming in). 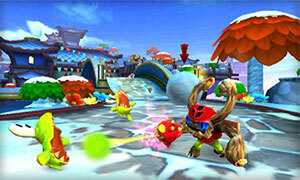 Skylanders: Trap Team has officially released in Australia and the review embargo has been lifted. The reviews out so far have a generally positive overall feel to them but they aren't without their misgivings. 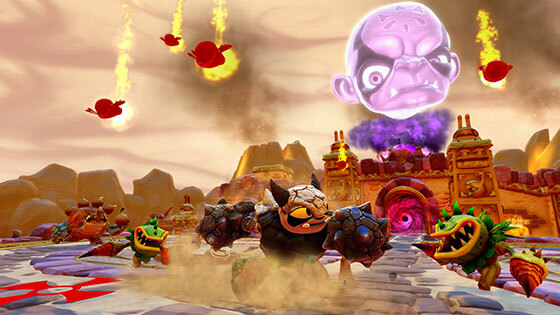 The bright spotlight being shined on its core figures and villains makes Skylanders: Trap Team feel like a fresh start for the franchise. Without completely abandoning the characters and concepts introduced over the past three years, it feels more like a self-contained experience rather than a continuation. 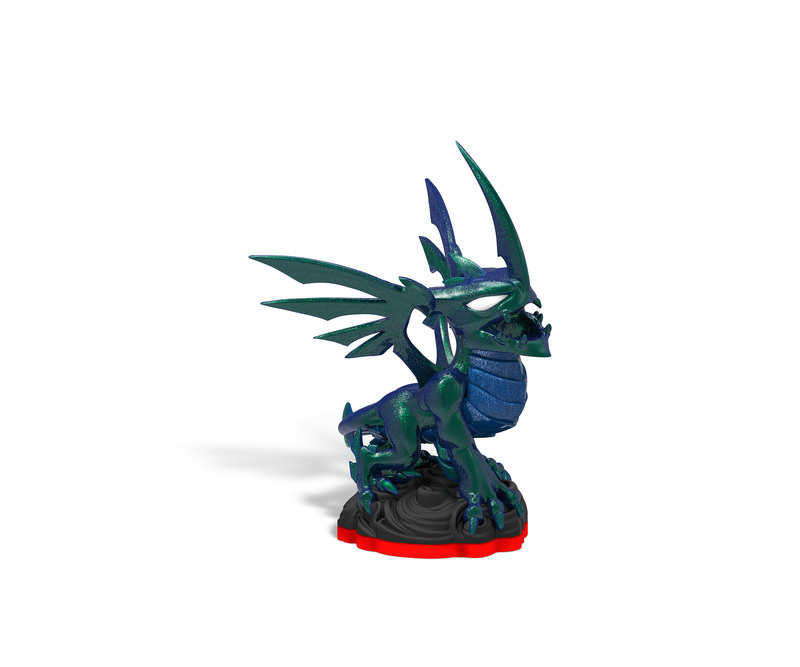 What's great about the Skylanders series is that, beyond the humorous story and light action RPG gameplay, the games are so chock full of content that players can spend weeks trying to play through it all. 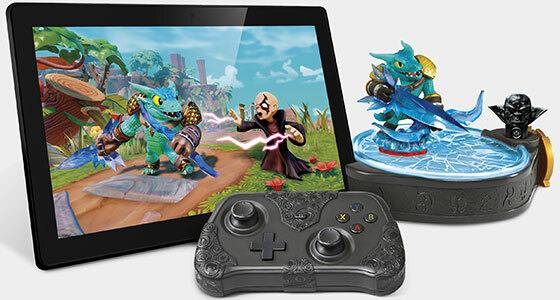 Skylanders Trap Team on tablets matches up well with the home console version of the game. While the tablet version doesn't look quite as good as the next generation version of the game, Skylanders Trap Team still packs a whole lot of high quality content for a tablet release that most other mobile games simply can not compare with. 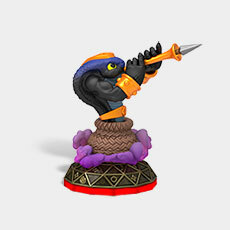 Skylanders Trap Team is a fantastic, well-made game. 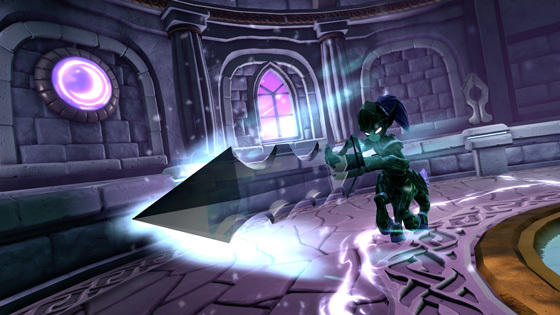 The lengthy story mode is filled with excellent gameplay set in gorgeous environments with top-shelf graphics and sound. 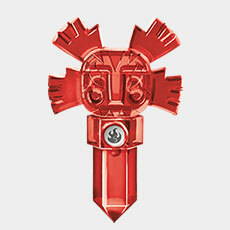 The bonus modes, while focused mostly on combat, are a lot of fun. 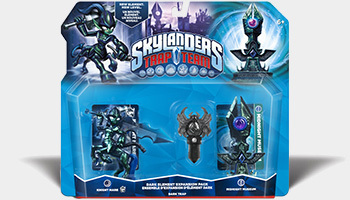 Even with its creative zigzags that shift Kaos' allegiance for a time to provide new enemies for the Skylanders to chase and jokes for Flynn to crack, Trap Team feels more like a standalone reboot ordered from the top of Activision's food chain; a reaction to increasing competition in the Toys to Life genre that shifts the target demographic back a few years. But what exquisite pieces of plastic they are! The designs for the Trap Team Skylanders all have a translucent weapon that's undeniably cool. 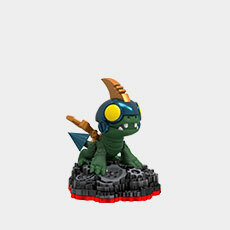 The expressions on the faces and the poses of the figures telegraph movement and style, and the new Mini Skylanders are all cute as hell. 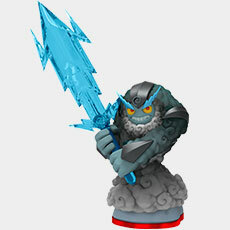 If there are two things that always astonishes me about any Skylanders game it is the creativity that goes into it and how they don’t rely on licensed characters, and Trap Team carries on this heritage. The new Trap Master characters are great. 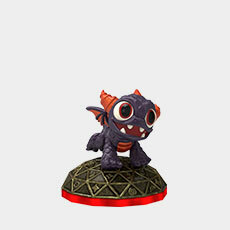 As with all Skylander games, there is a lot of variety here in the gameplay department. 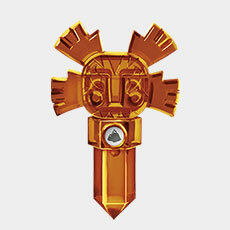 In addition to battling enemies you will do a lot of (simple) puzzle solving. Remember, this is a game designed for the younger gamers in your household so don't expect anything that will truly tax your brain. Giving Toys for Bob an extra year to work on this sequel paid off, not just with the concept of villains partnering with heroes, but the world they inhabit feeling more alive. 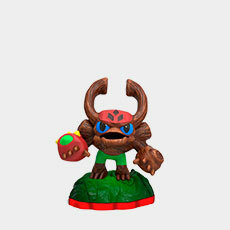 In most ways, Skylanders Trap Team is the best game in the series. The abundance of inventive and genuinely fun characters, and the inclusion of playable villains, means there's always some amazing new trick to try. 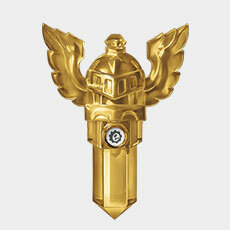 Gameplay in Trap Team feels distinct from previous series entries as a result. The trap-and-swap mechanic works well, and it makes combat more eventful and strategic than before. I've only spotted the one 3DS review so far and it is definitely on the negative side. 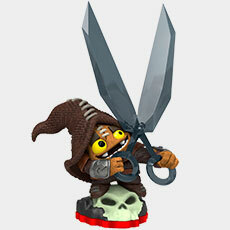 Skylanders Trap Team's main gameplay is very mediocre. 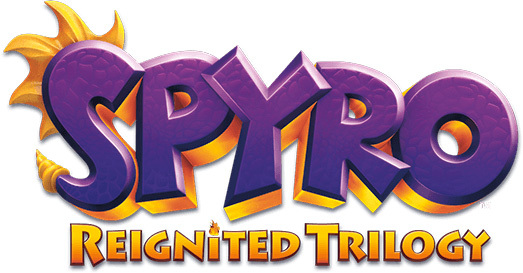 At its best, it's a passable 3D platformer, and at its worst, it's a stiffly controlled and boring mess. 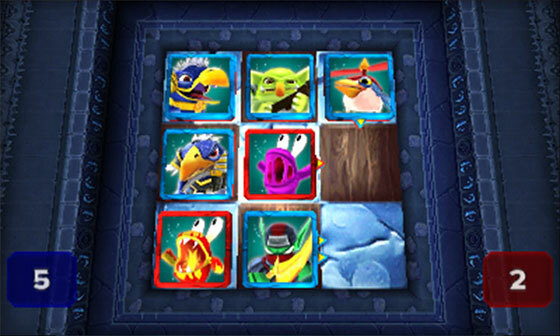 The other gameplay aspects, that is, the focused villain challenges and Skystones card game, are fun, but it's not enough to wash away the tedium of the main game. Congratulations to the winner of the $100,000 scholarship, Phylicia Nakamoto, who submitted the name "High Five" for the Frito-Lay contest that took place earlier this year. The name will now be the character's official name. 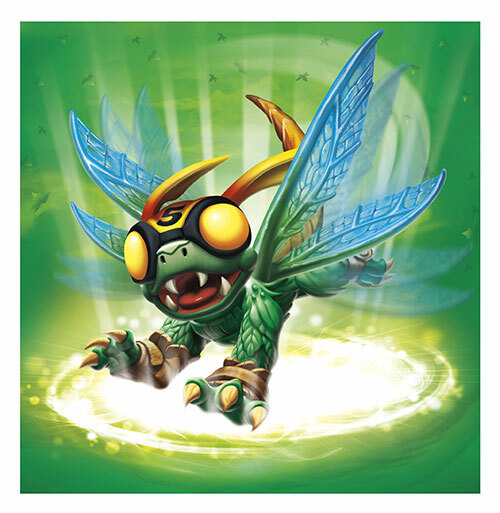 High Five is one of the most skilled sky racers of all the dragonflies. But as the fifth son of the Royal High Flying Dragonflies, he was not allowed to enter any of the racing tournaments that took place each year because of his age. 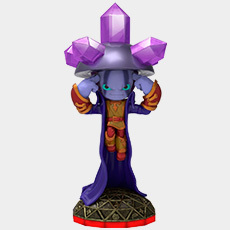 Instead, he was forced to watch from the sidelines as his four older brothers competed for the coveted Trophy of Sparx, which legend has said holds magical properties. 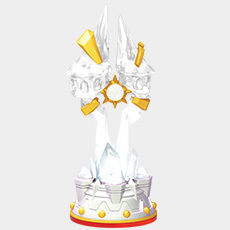 One year, during the biggest racing event of the season, High Five learned that the Troll Racing Team had stolen the valuable trophy and were going to use the race to cover their escape. He quickly took action, jumping into the race and using his amazing flying skills to weave and dodge his way to the front of the pack, where he caught up to the trolls and brought them down. 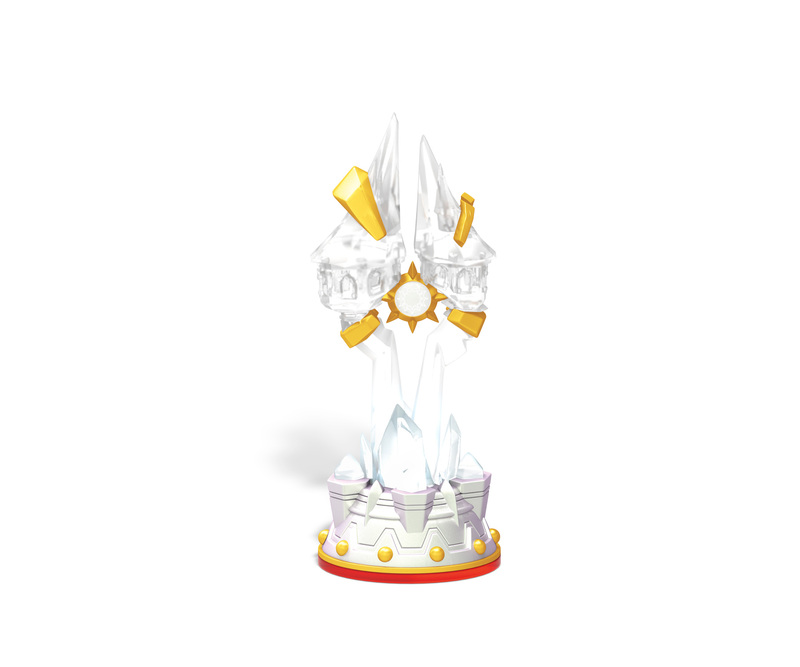 For his actions, High Five was given the Trophy of Sparx. 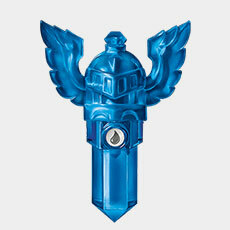 Even more importantly, he was made a Skylander, where he now helps protect Skylands from any evildoers. 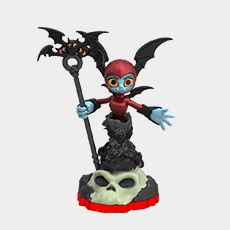 And in a twist (that forum goers have already spotted on the back of boxes) the other two voted upon names, Flip Wreck and Bat Spin, have also been chosen to be used as the official names for their respective Skylanders. As for how to get him, starting in mid October Frito-Lay will be running a giveaway of High Five using the Blippar app, you'll just need to scan the back of a specially marked variety pack to enter. 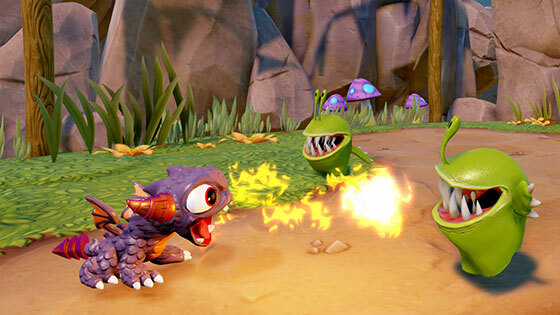 Activision have today shown off, at long last, images, videos and details on the Nintendo 3DS edition of Skylanders Trap Team. The portable game will again have a story completely unique to that of the consoles and will feature 14 exclusive escaped villains. 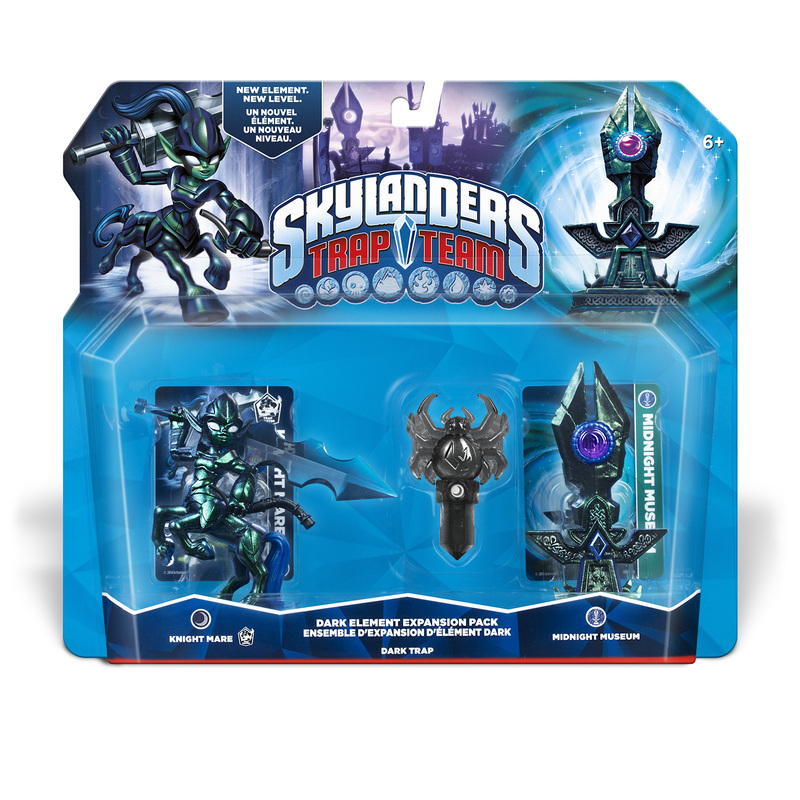 This time you'll be fighting the evil Dream Sheep who is trying to put the whole of Skylands to sleep with his Sleep Dragon. 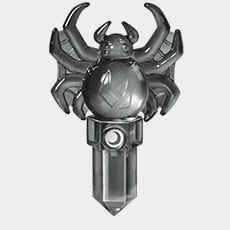 Instead of using Traps to capture the villains the 3DS makes use of its touch screen to capture them, meaning that the villains cannot be used in the console version and vice versa. You can use the villains in regular gameplay but also in some special "boot camp" training levels. 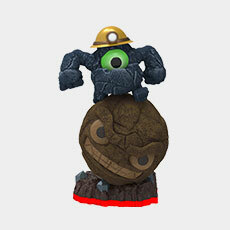 The game also features a multiplayer version of Skystones which you can play online over WiFi, interestingly it's the original form of Skystones seen in Skylanders Giants rather than the new Skystones from the console versions of Trap Team. 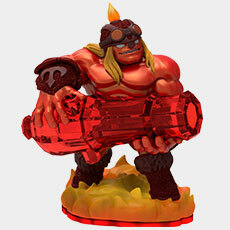 The 3DS Starter Pack will come with Gusto, Barkley and a Portal of Power. So no traps and no exclusive alt-deco. Check out the gallery for some more screenshots of the game and this EvanTubeHD video for footage of the game in action (including a glimpse at a Moon icon and a Sun icon at the bottom of the other elements). 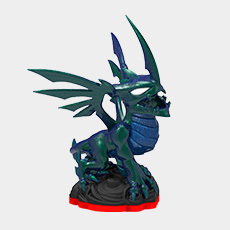 Earlier today the official Skylanders website updated to include (almost) all of the brand new Skylanders and Villains that you'll be able to play as in Skylanders: Trap Team. 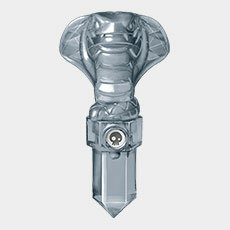 You can see all of the villain artwork in much greater detail than we've previously seen on the poster, as well as a few new trap moulds including a Snake, a Sword, and a Rocket along with several others. They also each have a short audio line as well as their theme music. 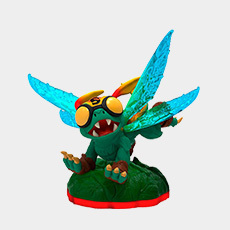 The Skylanders each have their own full sized artwork, a small image of the toy, a few screenshots and a video along with their backstory, card stats and audio catchphrase. 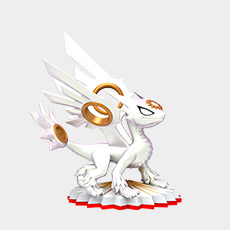 Amongst all of that one brand new Skylander variant has been unveiled, as seen above it's a Legendary Deja Vu. 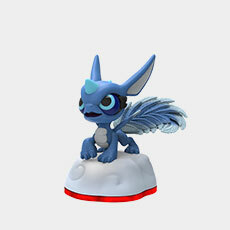 No sign of any of the mystery Skylanders just yet. Also announced today was a brand new game mode debuting in Trap Team called "Kaos Doom Challenge". 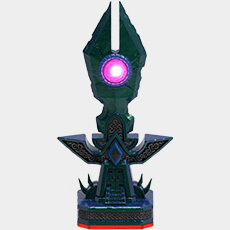 In it you will be fighting waves and waves of enemies that Kaos is sending to attack you, you'll be able to build special defense towers that help you to keep them away from the "Mystery Box of Doom" which unleashes a gigantic villain if opened. 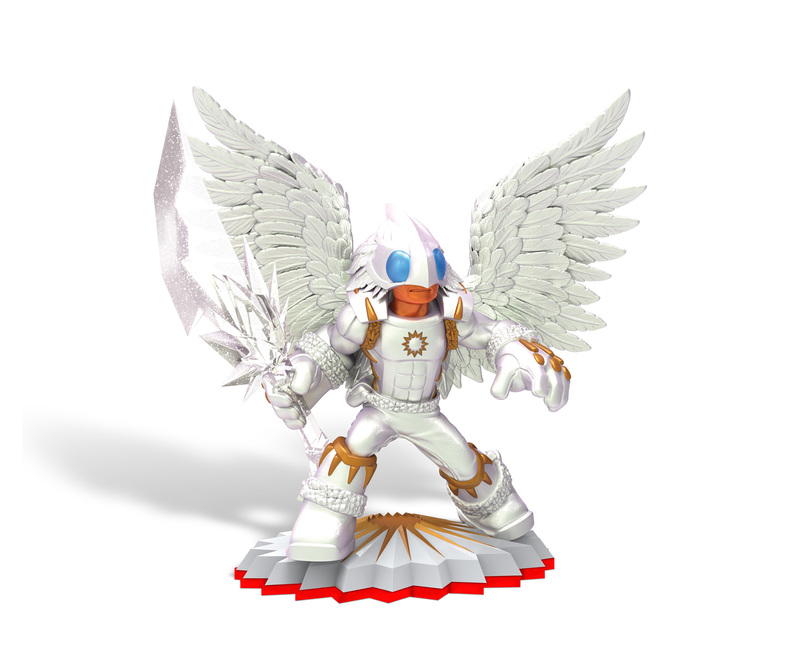 A recent evil study of a thousand trolls revealed that nine out of ten agree that I am the most powerful and impressive evil doer to have ever conquered Skylands. Naturally, I had every tenth one banished to my "Kaos Doom Challenge" to test the effectiveness of my 100 waves of ultimate evil doom - and they were never heard from again. 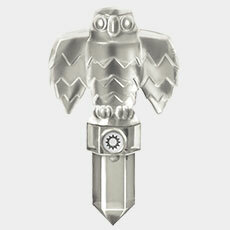 So let's just say EVERYONE agrees - I am the most powerful and impressive evil doer ever. 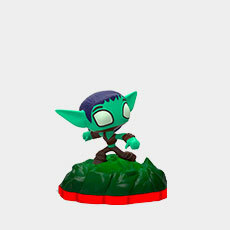 There are a few videos going through a few waves by The Skylander Boy And Girl and Coin-op TV that you can check out to get a better idea of exactly what this mode is going to be like. 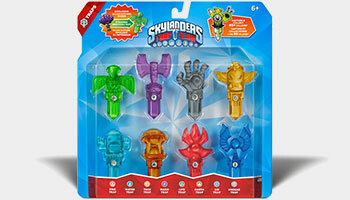 The only Skylanders we still don't know the names of are the three Frito-Lay Skylanders and whoever those four question marks represent in the top right corner. The poster also lists names and elements for nearly all of the villains, including a couple of new "Super" villains Dreamcatcher and Golden Queen, but again there are two Super Villains still hidden behind question marks along with six of the regular villains. 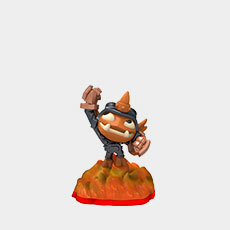 In previous games the sidekicks simply followed your characters around not doing much, in Skylanders: Trap Team that's all going to change. 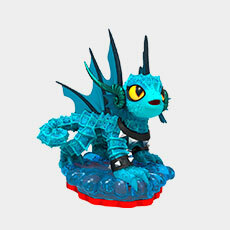 Now known as "Mini Skylanders" the existing eight have been reissued and joined by a new set of eight mini versions of previous characters and they have all been promoted to fully playable Skylanders. The eight previously released sidekicks will also be given a rerelease with a red base but your existing green and orange base versions will function exactly the same as the new ones. 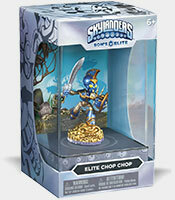 The Minis will be sold in double packs retailing for $13.99. 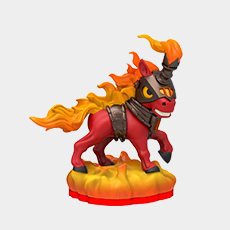 Also revealed for gamescom today was a new Fire Trap Master called Kaboom, we got a look at Head Rush's figure as well as a clearer look at Bushwhack. 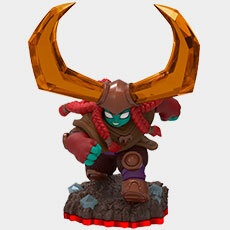 And couple of new villains, Masker Mind and Brawlrus, were unveiled too. 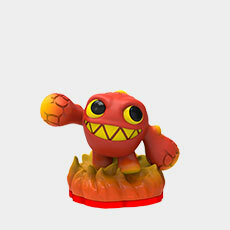 Check them all out in the gallery and figure list. Hidden away in a trailer for today's Trap Team on Tablets news announcement was a shot of the full character poster that will be included with the regular Skylanders: Trap Team Starter Packs, thereby showing off a slightly blurry first look at the remaining new Trap Masters, the new Core characters, a bunch of new Sidekicks based on existing pre-Trap Team characters as well as a whole load of capturable villains. 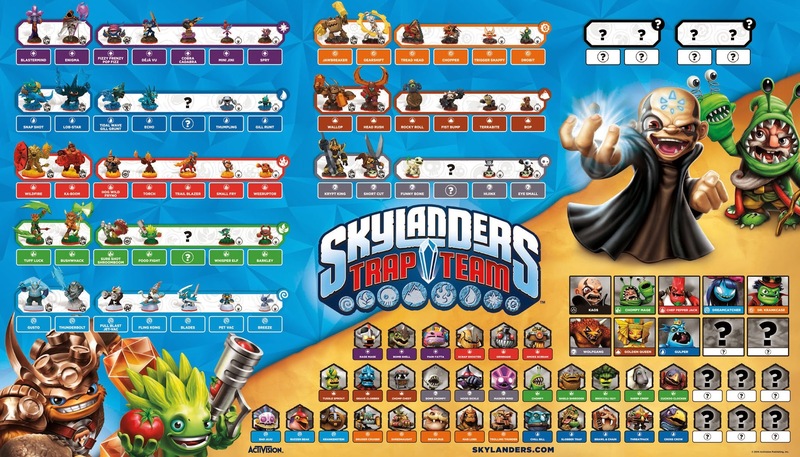 The names are not on there and there are still several secret Skylanders and villains marked on the poster so there's still a lot left to find out before the launch of the game in October. And perhaps even beyond if they intend to keep up those mystery entries. Thanks to forum member ZapNorris for spotting the poster.